Admission to Shawnee State University baccalaureate or associate degree programs is determined by an applicant’s (1) earned high school diploma from a state chartered or regionally accredited high school and to students who have earned high school equivalency through the General Education Development (GED) program, (2) level of “college preparedness” as defined by the State of Ohio’s UNIFORM STATEWIDE STANDARDS for REMEDIATION-FREE STATUS, and (3) ability to meet the requirements of a specific selective-admission program. If you intend to apply for admission to the teacher education or a health science program, you should refer to the appropriate sections of this catalog for specific admission requirements. Admission to students not seeking a degree at Shawnee State University is also open. You may complete and submit the application form on-line via the SSU home page at www.shawnee.edu. There are varying additional requirements for students in different categories, including recent high school graduates, transfer students, special non-degree students, transient students, international students, and eligible students who are still attending high school. Requirements for each are discussed in the following sections. These courses are recommendations, not requirements. However, if you have a deficiency in English or mathematics, you will be required to take developmental courses prior to attempting college level work. All students pursuing the four-year baccalaureate or two-year associate degrees or the one-year certificate are required to have scores from the American College Test (ACT) or Scholastic Aptitude Test (SAT) forwarded to Shawnee State University. Only applicants who are 21 years of age or older, as of the first day of their first semester of enrollment, are exempt from providing ACT or SAT scores. Although Shawnee State has an open admission policy and does not use the ACT or SAT for determining admission to the University, it does require results of these tests for use in advisement and placement. Students who have not yet taken the ACT or SAT may contact www.actstudent.org or www.collegeboard.com for information about future test dates. High school graduates who have been awarded a state-approved diploma are required to submit a final, official transcript of academic work to Shawnee State University. Students should send a written request to the high school requesting an official transcript to be forwarded directly to the University. Transcripts may be mailed directly from the high school to the following address: Office of Admission, Shawnee State University, 940 Second Street, Portsmouth, Ohio 45662-4344. Applicants may also hand-carry the transcript in an envelope sealed with a school counselor’s signature. School counselors may send transcripts via FAX to 740.351.3111 if accompanied by a signed transmittal form or by electronic transfer. The University reserves the right to verify the final, official authenticity of any student’s transcript. Any transcript document found to be fraudulent becomes the student’s responsibility and the University reserves the right to withdraw admission acknowledgment and/or approval of acceptance. You may be awarded college credit for satisfactory performance on certain proficiency examinations. Each May, participating high schools provide their students with an opportunity to take examinations in a variety of subject areas through the Advanced Placement (AP) Program, sponsored by the College Board and administered by Educational Testing Service (ETS). Students who achieve a grade of 3 or above may receive college credit on the basis of these examinations. Credit given through the AP program does not apply toward the residency requirement for graduation. In addition, Shawnee State University recognizes that some courses completed in high school or vocational school may be equivalent to some entry-level coursework at Shawnee State. In order to avoid repetition of such courses and to encourage advanced study in the respective disciplines, Shawnee State has entered into ”Articulation Agreements” with high schools, vocational schools, and school districts. This allows the award of advanced placement credit for certain coursework completed at the high school where articulation agreements are in place. Such credit waives your course requirement. A more advanced class must be completed to replace the waived course. Please contact the Office of the Registrar for information concerning eligibility for credit through advanced placement. A list of current AP course equivalencies can be located on the Office of the Registrar page of the Shawnee State University website. Students who have successfully completed the GED may use the special GED transcript request form (available in the admission office) to have official GED transcripts sent to the University or they may request official transcripts directly from the State GED Office, Ohio Department of Education, 25 South Front Street, Room 210, Columbus, Ohio 43215 or State GED Office,Kentucky Department of Education, Frankfort, Kentucky 40601. If you obtained your GED in another state, please contact the respective state department directly. Transcripts should be mailed to the following address: Office of Admission, Shawnee State University, 940 Second Street, Portsmouth, Ohio 45662-4344. Transcripts must be received directly from the State GED Office. If the University is not in receipt of your GED transcript, you may only register for classes as a special non-degree student and are ineligible for financial aid awards. Applicants not meeting the college preparedness standard will only be admitted into a non-selective admission associate degree program and be required to participate in University programs and courses for under-prepared college students. With the exception of selective programs, students matriculate into the academic department of their choice once they have demonstrated proficiency in college-level English and mathematics via the University’s placement tests or qualifying scores on the ACT/SAT/PRAXIS. Students seeking admission to selective programs will move from the University College to the program of their choice upon admission to that program. Those students who are “undecided” about their academic major may choose to remain in the University College until they have completed 60 semester hours of credit. The University College is also home to the Student Success Center located in Massie Hall. The Student Success Center offers many programs and activities that support students. Students who have attended other regionally accredited colleges or universities or have military credits may transfer to Shawnee State University provided they were in good academic standing at the institution attended most recently. In addition to the application for admission and high school transcript, you are required to provide an official transcript from each college or university previously attended. If you are eligible for and want to receive college credits for military coursework/experiences, then you must submit your transcript from the American Council on Education (ACE). Credit is based upon the ACE recommendations unless otherwise specified. Transcripts must be received directly for those institutions. Photocopies, fax, and hand-carried transcripts are not accepted. Credits applicable to the curriculum for which you are applying which were earned at regionally accredited colleges or universities are accepted at the time of admission. Generally, courses completed with a passing grade are eligible for transfer. The credit hours transferred do not become a part of the grade point average at Shawnee State University. To receive transfer credit, you must file an official transcript of previous college work with the Shawnee State University Office of Admission. You must earn a minimum of 16 credit hours at Shawnee State University to be considered for the award of an associate degree and a minimum of 30 credit hours to be considered for the award of a baccalaureate degree. You validate the award of credit by completing, with a grade of “C” or better, a planned program of courses totaling a minimum of 20 credit hours applicable to a four-year curriculum as approved by the Registrar. For students transferring credit from non-regionally accredited colleges or universities, a maximum of 60 semester hours will be considered for transfer. IMPORTANT NOTE: Transfer credit cannot be used to replace grades of courses taken at Shawnee State University. Institutional Transfer. The Ohio Board of Regents, following the directive of the Ohio General Assembly, has developed a statewide policy to facilitate movement of students and transfer credits from one Ohio public college or university to another. The purpose of the State Policy is to avoid duplication of course requirements and to enhance student mobility throughout Ohio’s higher education system. Since independent colleges and universities in Ohio may or may not be participating in the transfer policy, students interested in transferring to an independent institution are encouraged to check with the college or university of their choice regarding transfer agreements. Transfer Module. The Ohio Board of Regents’ Transfer and Articulation Policy established the Transfer Module, which is a specific subset or the entire set of a college or university’s general education requirements. The Transfer Module contains 36-40 semester hours of specified course credits in English composition, mathematics, fine arts, humanities, social science, behavioral science, natural science, physical science, and interdisciplinary coursework. A transfer module completed at one college or university will automatically meet the requirements of the transfer module at the receiving institution, once the student is accepted. Students may be required, however, to meet additional general education requirements that are not included in the Transfer Module. The policy encourages receiving institutions to give preferential consideration for admission to students who complete the Transfer Module and either the associate of arts or the associate of science degrees. These students will be able to transfer all courses in which they received a passing grade of “D” or better. Students must have an overall grade point average of 2.0 to be given credit for the Transfer Module. The policy also encourages receiving institutions to give preferential consideration for admission to students who complete the Transfer Module with a grade of “C” or better in each course and 60 semester hours. Students must have an overall grade point average of 2.0 to be given credit for the Transfer Module and only courses in which a “C” or better has been earned will transfer. The policy encourages receiving institutions to admit, on a non-preferential consideration basis, students who complete the Transfer Module with a grade of “C” or better in each course and less than 60 semester hours. These students will be able to transfer all courses in which they received a grade of “C” or better. Admission to a given institution, however, does not guarantee that a transfer student will be automatically admitted to all majors, minors, or fields of concentration at that institution. Once admitted, transfer students shall be subject to the same regulations governing applicability of catalog requirements as all other students. Furthermore, transfer students shall be accorded the same class standing and other privileges as native students on the basis of the number of credits earned. All residency requirements must be successfully completed at the receiving institution prior to the granting of a degree. Responsibilities of Students. In order to facilitate transfer with maximum applicability of transfer credit, prospective transfer students should plan a course of study that will meet the requirements of a degree program at the receiving institution. Specifically, you should identify early in your collegiate studies an institution and major to which you desire to transfer. Furthermore, you should determine if there are language requirements or any special course requirements that can be met during the freshman or sophomore year. This will enable you to plan and pursue a course of study that will articulate with the receiving institution’s major. You are encouraged to seek further information regarding transfer from both your advisor and the college or university to which you plan to transfer. Appeals Process. A multi-level, broad based appeal process is required to be in place at each institution. A student disagreeing with the application of transfer credit by the receiving institution shall be informed of the right to appeal the decision and the process for filing the appeal. Each institution shall make available to students the appeal process for that specific college or university. Historical Context. On November 16, 1990, the Ohio Board of Regents passed a resolution mandating that public institutions of higher education establish a multilevel appeal procedure to be followed by students dissatisfied with the applicability of transferred credit. The following multilevel appeal procedure at Shawnee State University is designed to meet the needs of these students and to comply with the Ohio Board of Regents’ mandate. Acceptance of Transfer Credit. Transfer credit is awarded and posted to your Shawnee State University transcript in accordance with accepted national and state standards. Generally, all courses satisfactorily completed at regionally accredited institutions are transferable. The Office of the Registrar is responsible for posting this credit to your transcript. Applicability of Transfer Credit. After transfer credit has been posted to your transcript, the Office of the Registrar posts the courses to your Degree Audit and provides you with a copy of the audit. Multilevel Appeals Procedure. State mandate requires that you be notified of your right to appeal a transfer credit applicability decision. You must file your written appeal within ninety days following receipt of your Degree Audit. The University must respond to your appeal within thirty days of receipt of the appeal, at each appeal level. The appeal levels are defined below. You meet with the dean of the college in which you are enrolled to discuss the course(s) in question. If both the dean and you are in agreement that a change in applicability is desirable, the dean reports the necessary change with rationale to the registrar. If the dean determines that an applicability change is not warranted, the dean notifies you, the Transfer Credit Appeals Committee chair, and the provost regarding the decision and the rationale. The registrar and the GEP director serve as voting ex officio members of the committee. If the committee determines that a change in applicability is desirable, the committee chair reports the necessary change with rationale to you, the dean, and the registrar. If the committee determines that an applicability change is not warranted, the committee chair notifies you, the dean, and the provost regarding the decision and the rationale. If you and the Transfer Credit Appeals Committee are unable to reach a mutually agreeable resolution, you present your case to the provost. If the provost determines that a change in applicability is desirable, he or she reports the necessary change with rationale to you, the dean, the Transfer Credit Appeals Committee chair, and the registrar. If the provost determines that a change in applicability is not warranted, the provost notifies you, the dean, and the Transfer Credit Appeals Committee chair of the decision and the rationale. You have no further recourse within the institution. Transfer Credit Appeals Committee Membership. Faculty representatives to the Transfer Credit Appeals Committee are determined by a procedure agreed upon by the faculty within their respective units as indicated in Level 2. Committee members annually elect a chair. The committee chair votes only in the event of a tie. Staggered terms of three years begin January 1. Elected representatives may be required to meet during the summer months if a student submits an appeal during that time period. Deans may appoint alternates if necessary. The registrar and the GEP director serve as voting ex officio committee members. * Courses in Areas III and IV must be from two different disciplines. All official secondary and post-secondary transcripts. These transcripts must be in the student’s native language and be accompanied by a certified English translation. If these credentials cannot be evaluated by the University, you must have them sent to an evaluation service. You will be responsible for the cost of the evaluation. An official score of at least 500 (paper) or 207 (computer) on the Test of English as a Foreign Language (TOEFL) or an equivalent score on the Michigan Test of English Language Proficiency (MTELP) is required for admission to a degree program for students whose native language is not English. Proof of financial resources which are adequate to support the student for one year. If you intend to finance your education yourself, you must supply a statement from your bank showing funds equal to those required for one year. If you are being sponsored, an affidavit of support and a bank statement showing adequate funds for one year must be submitted. International students are required to purchase health insurance while in the United States. Health insurance information may be found in the Student Business Center. Those international applicants who are accepted for admission will receive an acceptance letter and an I-20 form to be used to secure a student visa. The acceptance letter and I-20 will not be issued until the Office of Admission has received all required materials. To be assured consideration for admission, all required materials must be received 60 days prior to the beginning of the semester in which you plan to enroll. Questions pertaining to a student visa should be directed to the local office of the Department of Immigration. Students who are not interested in pursuing a degree but who wish to take courses are required to file an application for admission. Transcripts of high school and college work are not required, nor is ACT/SAT testing. However, if at a later time, you decide to pursue a degree program, all admission requirements in effect at the time of initial enrollment must be met. These requirements include official transcripts from high school (and/or GED) and college work and testing, recommendations, etc., if any of these are required for the major being declared. Special, non-degree students may take courses which have no prerequisites or courses for which they have the appropriate prerequisite. For courses assuming prior knowledge or a certain degree of proficiency, placement testing may be advised or required prior to registration. Students who are enrolled at or seeking a degree at another college or university, but who wish to take coursework temporarily at Shawnee State University, are considered guest students. 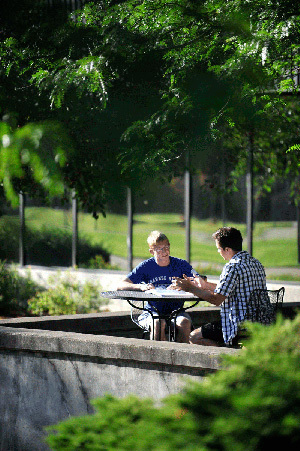 As non-degree students (at Shawnee State), such students are required only to file an application for admission.Although transcripts of high school and college work are not required of guest students, such transcripts, especially those from your home campus, are helpful in advising appropriate coursework. Unofficial transcripts or grade cards are acceptable if these are needed to verify prerequisites for courses to be taken at Shawnee State University. Guest students are strongly advised to consult with the appropriate counselor or advisor at the home college or university as to the appropriate coursework to be taken at Shawnee State and how that coursework will transfer to the home campus of the guest student. If, as a guest student, you decide to seek a degree at Shawnee State University, you become a ”transfer student” and are bound to all requirements for a degree-seeking transfer student, including whatever requirements existed for the major to be pursued at Shawnee State at the time of your initial enrollment. Shawnee State University admits senior citizens (60 years of age or older) for courses on an audit, space-available basis. Although formal application and registration are required, no tuition fees are charged. Lab and other miscellaneous fees are the responsibility of the student. There is also a special, no cost, fitness program for seniors. Applications may be obtained at the James A. Rhodes Athletic Center. College Credit Plus offers academically talented high school students the opportunity to take, in a college setting, courses which enhance coursework available at their high schools and which are clearly at the college level. Students interested in this program must qualify at the end of their sixth grade year to participate as a seventh grader, seventh grade year to participate as an eighth grader, eighth grade year to participate as a freshman, their freshman year to participate as a sophomore, sophomore year to participate as a junior, or in their junior year to participate as a senior. Because the courses taken under this program are at the collegiate level, it should be expected that these courses are more demanding and completed at a faster pace than those taken in high school. They generally require more out-of-class preparation than high school classes. You and your parents should also consider the emotional and social maturity necessary to study in an adult environment in which most students are in their late teens/early twenties and assess your ability to accept independence and responsibility for your academic performance. Be a resident of the state of Ohio. Have completed a minimum of sixth grade and be of seventh grade status, as defined by the school district. The application process begins during the student’s sixth grade, seventh grade, eighth grade, freshman, sophomore, or junior years. Be commuting from your permanent residence and attending a high school within commuting distance. Place into college level course work in English and mathematics. Provide official results of the ACT, with a score of at least 18 on the English and mathematics sections. Maintain a minimum grade point average (GPA) for all college courses completed, based upon current standards and must remain in academic and disciplinary “good standing” at the University and their local school to remain eligible for College Credit Plus. Student/parent/guardian pays for tuition, fees, books, and materials - Class is taken on the college campus for college credit only. All requirements listed under Option B below (except method of payment) apply to Option A. Tuition will be paid for by the state based on the negotiated agreement between the participant’s secondary school and Shawnee State University. The participant’s secondary school will pay for textbooks and Shawnee State will waive payment of all other fees related to participation in the College Credit Plus Program. Note: If a student withdraws from a class after the fifth day of class, any and all costs may become the responsibility of the student and the student’s parents/guardians (depending upon the school district policy). Students choosing this option should seek counseling from high school personnel as to which college courses will meet graduation requirements at your school. Successfully completed courses under Option B receive appropriate high school credit as determined by the student’s school district. After graduation from high school, the college credits earned through Shawnee State University may be applied toward an SSU degree or transferred to another university according to the transfer policies of the receiving institution. Courses may be taken under College Credit Plus during fall and spring semesters only. However, students may take summer courses at their own expense. College Credit Plus participants are limited to taking only as many credit hours available based upon the remaining number of Carnegie equivalent units available at the high school. Students participating in Shawnee State University’s College Credit Plus Program are required to maintain a minimum grade point average (GPA) for all college courses completed, based upon current standards and must remain in academic and disciplinary “good standing” at the University and their local school to remain eligible for College Credit Plus. Note: Shawnee State University will honor any disciplinary action taken by the home school affecting a student in the College Credit Plus Program. The acknowledgment form is needed only once, at the time of application. To participate in the College Credit Plus program you must meet all requirements and apply by the April deadline of the previous academic year. A required College College Plus orientation and registration event for students accepted into the program is held in early May. Parents are encouraged to attend with their student. Grades are reported to the student via MySSU. For students who have chosen to use courses to complete high school requirements, the University will supply an official transcript of grades to the student’s high school principal/counselor. Courses are to be taken for college credit only. Your status will be Special Non-degree. Tuition, books, and fees are the responsibility of the student/parent(s)/guardian. You may attend only one course per semester. You must place into collegiate level math and English to enroll in courses requiring either proficiency. You must apply for admission, submitting the high school application for admission, and provide a written recommendation by your high school counselor or principal along with written permission from your parent(s)/guardian. Your course schedule must be approved by the Office of Admission or the Registrar. The Office of Admission, located in the University Center, offers group tours of campus, Monday through Friday, at 10:00 a.m., and 2:00 p.m. The office also schedules Saturday appointments. For an individual campus tour and personal appointment, please contact the Office of Admission at 740.351.4SSU or 800.959.2SSU to schedule a time that is convenient for you.